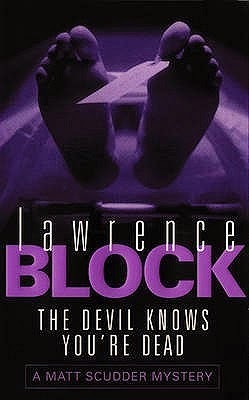 This is the eleventh entry in Lawrence Block's excellent Matthew Scudder series, and it remains my favorite book in the series. As the story opens, Scudder and his girlfriend, Elaine, are thrown together with a young couple named Glenn and Lisa Holtzmann. Elaine and Lisa are taking a class together; the Holtzmanns live in the same neighborhood as the hotel where Matt lives, and the two couples wind up going out to dinner one night. Matt is not overly impressed. He and Elaine have little in common with the younger couple and there's something about Glenn that puts Matt off. Given that they're something like neighbors, Matt runs into Holtzmann occasionally on the street and Holtzmann keeps proposing that they get together for lunch. Matt always manages to find a reason for refusing the offer and then, suddenly, he no longer needs one when Holtzmann is gunned down while using a pay phone a couple of blocks from his apartment. The police immediately charge a street person named George Sadecki with the killing, and the evidence seems overwhelming. The police do not recover the weapon used, but Sadecki, a Vietnam vet, has policed the area and the police find the shell casings in his jacket pocket. Sadecki, who has never been quite "right" mentally, admits that he might have killed Holtzmann, but he doesn't remember one way or the other. Sadecki's brother, Tom, knows Matt from AA, and doesn't believe that George would have been capable of killing anyone. He knows the odds are long, but he convinces Matt to look into the case in the hope of giving him some sort of closure. Matt agrees, although the case looks open-and-shut, and he warns Tom Sadecki not to expect much. In a case like this, SOP is to start by investigating the victim to see who, if anyone, might have had cause to wish him harm. On the surface, Glenn Holtzmann appears to be a pretty straightforward yuppie lawyer, but as Scudder begins poking around, he uncovers some secrets about the late Mr. Holtzmann that are troubling, to say the least. The case itself is intriguing, but what sets this book apart for me, above all the others in the series, is that Scudder is presented with two very critical moral issues that are not really directly related to the case itself. The real strength of this series has always been the development of the characters, Scudder in particular, and it's extremely interesting to watch him wrestle with these two issues. To describe either dilemma would be to give away too much. Suffice it to say, that neither is easy, and both will require that Matt look deeply into his own soul in the hope of finding some sort of resolution. Fair warning: watching him do so may well require the reader to examine his or her own conscience as well. This is at least the third time I've read this book, and I'll eagerly look forward to it again as I make my way through this series the next time--one of my favorite crime novels of all.